A medallion hand carved from carnelian, depicts double dragons surrounding a floating happiness symbol. 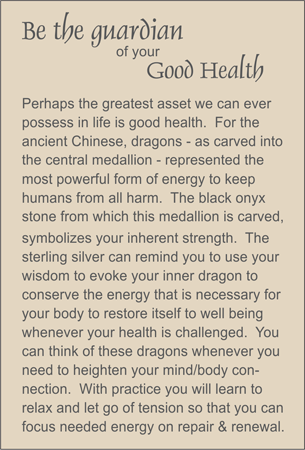 The ancient Chinese believed the dragon to be the most powerful symbol of energy and so the protectors. Here it is intended to provide a reminder of how we must protect our own good health. This medallion is suspended from a necklace of fiery agate pebbles set into trios of carnelian spheres flanked by rock quartz crystal ellipses. Sterling silver toggle clasp.